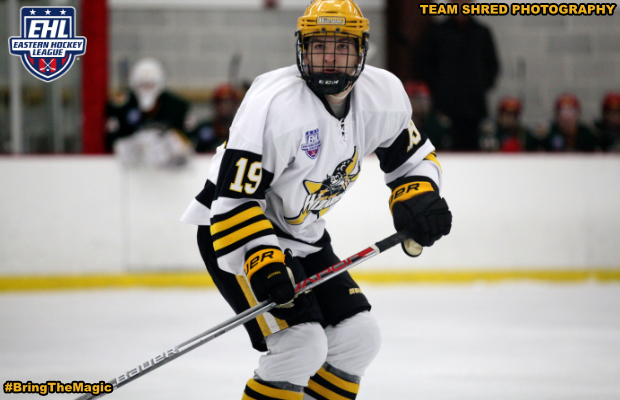 BEDFORD, MA -- The Eastern Hockey League put together the second showcase of the season this past Sunday and Monday at the Haverhill Valley Forum. There were over 40 scouts from various schools and programs in attendance over the course of the two-day event. On Sunday, the Wizards matched up against the Philadelphia Jr. Flyers for the final time in the regular season. The Wizards entered the game with a three-game winning streak on the line, as the team looked to avenge their earlier loss this season to the Jr. Flyers. Devin Panzeca and Dylan Schuett scored a pair of goals just 15 seconds apart to give the Wizards a 2-0 lead after the fist half of play. The 2nd half wasn't any different as Alec DeLuca and Josh Loveridge picked up the other two goals and the Wizards won by a final score of 4-1. Alec Marshall made 29 saves in net, as he earned his 2nd win of the season. Shifting gears to Monday morning, as the Wizards faced-off against the Philadelphia Little Flyers. This was the final time the two teams would play each other in the regular season, with the Little Flyers winning the first game between the two teams back in late September. Loveridge opened up the scoring on the power-play, but the Little Flyers would answer back with the next three goals. Despite a late power play goal from Matt Fuller, the Wizards fell to the Little Flyers 3-2. Coming out of the showcase the Wizards moved into the #5 spot in the newest edition of the EHL Power Rankings, with a record of 13-8-0. The squad will welcome a pair of Mid-Atlantic Division opponents to Bedford this weekend, starting with the Philadelphia Revolution on Friday, and then followed up by the Wilkes-Barre/Scranton Knights on Saturday.